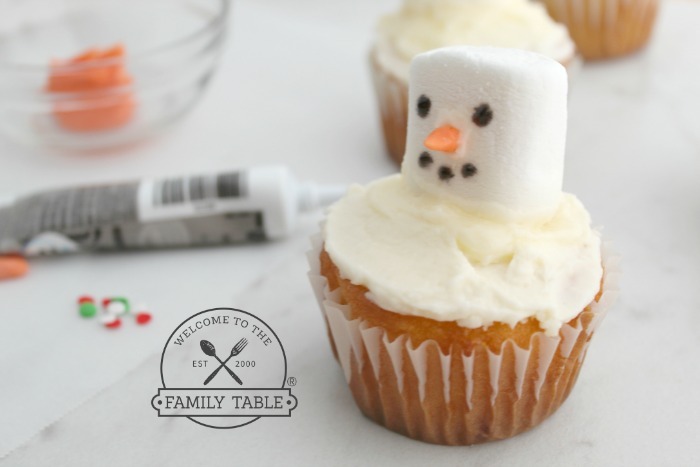 Melted snowman cupcakes are a family tradition to make when winter rolls around. 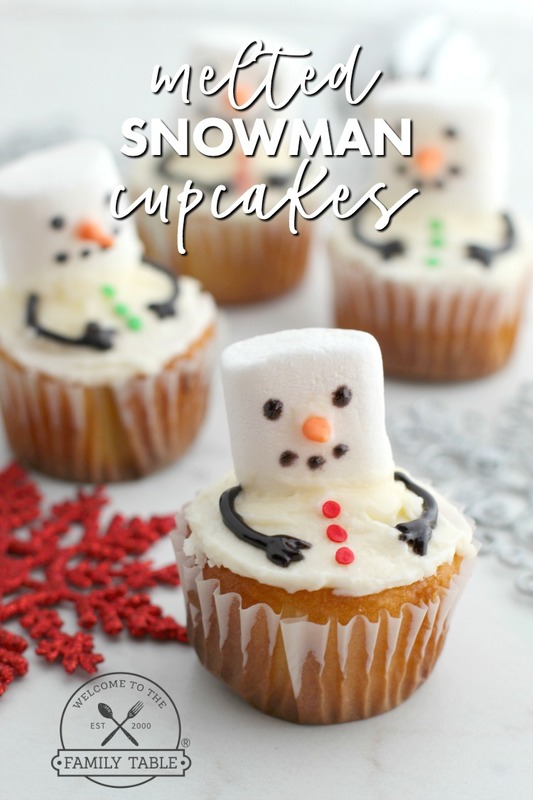 Not that we don’t love snowmen all year long, but there is something extra special about making these during winter. 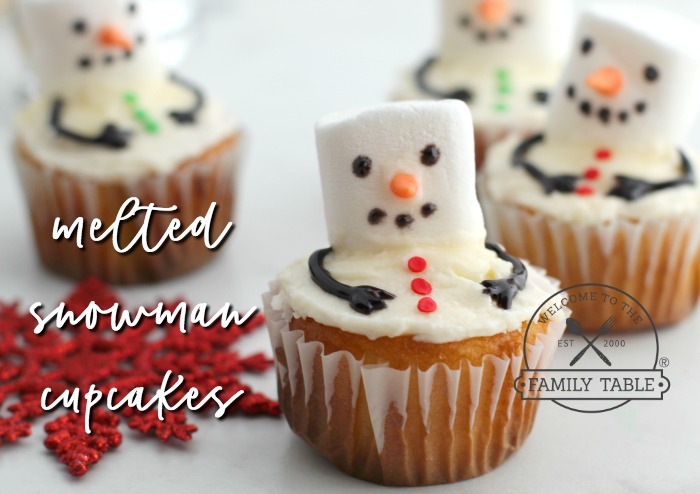 And the best part is that not only are these melted snowman cupcakes adorable, they are delicious too! 1. Smear a layer of white frosting on the bottom of a marshmallow and place towards the back of a cupcake. If there’s any gaps where the marshmallow meets the top of the cupcake, fill in with frosting. You want it to looks like it’s melting into the top of the cupcake. help secure it in place. 3. Using black icing, dab 2 dots on the marshmallow above the carrot nose for eyes, and create a mouth by dabbing dots under the carrot nose. Draw arms and hands coming out from the bottom sides of the marshmallow. 4. Gently place 3 confetti sprinkles in your desired colors down the front of the cupcake – in between the hands. These will resemble the buttons. Smear a layer of white frosting on the bottom of a marshmallow and place towards the back of a cupcake. 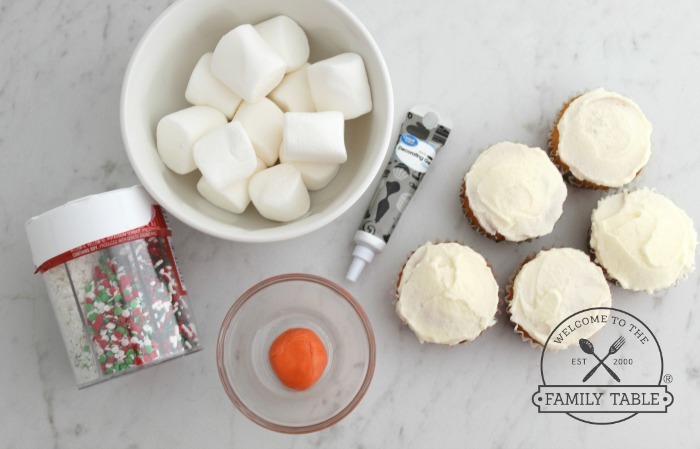 If there’s any gaps where the marshmallow meets the top of the cupcake, fill in with frosting. You want it to looks like it’s melting into the top of the cupcake. 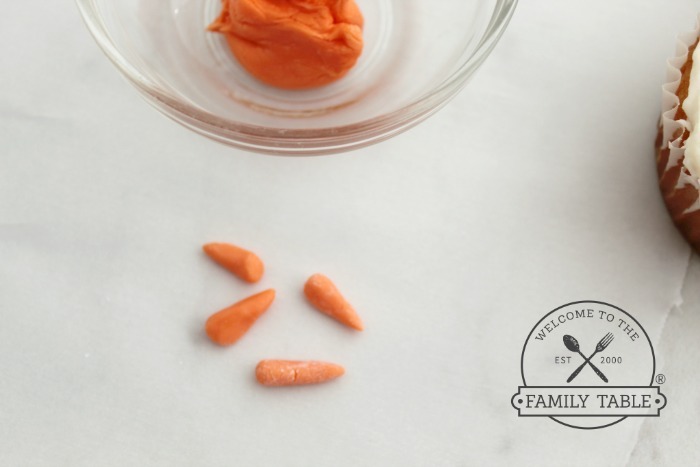 Shape small carrot noses out of the orange fondant. Dab a small bit of white frosting on the back of the carrot nose and gently press onto the front center of the marshmallow. You may need to hold it for a minute to allow it to start to dry and stick. Add a little extra frosting around the carrot nose if needed to help secure it in place. Using black icing, dab 2 dots on the marshmallow above the carrot nose for eyes, and create a mouth by dabbing dots under the carrot nose. Draw arms and hands coming out from the bottom sides of the marshmallow. Gently place 3 confetti sprinkles in your desired colors down the front of the cupcake – in between the hands. These will resemble the buttons.